A mix of homes, workspace, hotel, retail and leisure uses, as well as a new public square are being proposed to replace Derby's former Debenhams building as part of ambitious city centre regeneration plans at Becketwell. Leeds-based SJS is working in partnership with Derby City Council to deliver the regeneration. When completed, the aim of the scheme is to provide more than 500 residential units, a new public square, up to 25,000 sq m of business space, hotel, restaurants and cafes and a 500-capacity multi-storey car park. 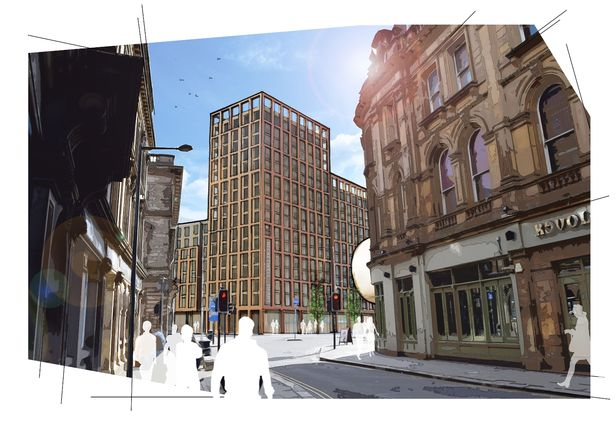 Plans include two apartment buildings - the tallest of the two buildings will contain 220 apartments over a ground floor café and restaurant overlooking the square. The smaller building will house 90 apartments over a new shop. In response to local feedback, this building has been carefully designed to retain the curve on the frontage of the current buildings in Victoria Street. A new public square will be the centrepiece of the proposed development and will be delivered as part of the first phase of regeneration. SJS was given 12 months last March to work up plans for the area. Paul Morris, director of SJS, said: "SJS have successfully delivered similar award-winning developments in other cities and are confident about the potential of Becket Well and the positive impact that a high-quality development can have on the city centre." The site of the former Debenhams building on Victoria Street will be the first area to undergo development as the central focus of phase one. Demolition work is set to take place in summer 2019, with construction work set to commence in the spring of 2020.